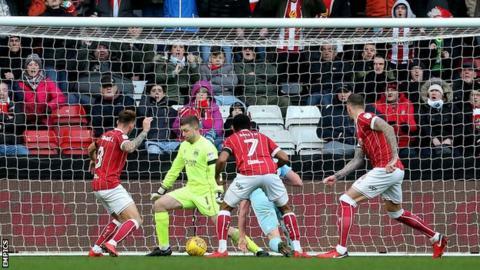 Championship strugglers Sunderland came from 3-0 down to rescue a point at promotion hopefuls Bristol City. ‪Sunderland are 23rd, one point above bottom side Burton Albion and three points from safety. "It's probably poor decision-making by me. I have to hold my hands up and say, tactically, I got it wrong in the second half. "I should have settled for 3-0. I probably got excited, and felt they were there for the taking. "We had chances but we crumbled. I should have given the lads a bit more help and put another midfielder on at 3-1, and changed it up a bit. "So, my fault, and apologies. To lose those two points is very, very frustrating." "I didn't see the first 45 minutes coming. I thought we would have learned our lesson from the last couple of games but we clearly hadn't. "The fight-back was fantastic. We got booed off at half-time - and rightly so - but the players earned the three points themselves. "It is a matter of mentality and you must never give up, no matter how bad it is. It is about responsibility and accountability and they showed some courage. Match ends, Bristol City 3, Sunderland 3. Second Half ends, Bristol City 3, Sunderland 3. Offside, Bristol City. Aden Flint tries a through ball, but Bailey Wright is caught offside. Kazenga Lua Lua (Sunderland) wins a free kick in the defensive half. Substitution, Bristol City. Liam Walsh replaces Famara Diedhiou. Substitution, Bristol City. Hördur Bjorgvin Magnusson replaces Ryan Kent. Own Goal by Marlon Pack, Bristol City. Bristol City 3, Sunderland 3. Hand ball by Joel Asoro (Sunderland). Corner, Sunderland. Conceded by Frank Fielding. Attempt saved. Ashley Fletcher (Sunderland) right footed shot from the centre of the box is saved in the centre of the goal. Attempt saved. Kazenga Lua Lua (Sunderland) right footed shot from outside the box is saved in the centre of the goal. Assisted by Ashley Fletcher. Attempt missed. Ryan Kent (Bristol City) left footed shot from the left side of the box is close, but misses to the right. Assisted by Famara Diedhiou. Attempt blocked. Marlon Pack (Bristol City) right footed shot from outside the box is blocked. Assisted by Ryan Kent. Substitution, Sunderland. Ethan Robson replaces Ovie Ejaria. Offside, Bristol City. Joe Bryan tries a through ball, but Jamie Paterson is caught offside. Goal! Bristol City 3, Sunderland 2. Aiden McGeady (Sunderland) right footed shot from the centre of the box to the bottom left corner. Assisted by Lee Cattermole following a set piece situation. Joel Asoro (Sunderland) wins a free kick on the right wing. Lois Diony (Bristol City) wins a free kick in the attacking half. Own Goal by Josh Brownhill, Bristol City. Bristol City 3, Sunderland 1. Lee Cattermole (Sunderland) hits the bar with a header from the centre of the box. Assisted by Billy Jones with a cross. Attempt blocked. Joel Asoro (Sunderland) left footed shot from the centre of the box is blocked. Assisted by George Honeyman. Attempt missed. Lee Cattermole (Sunderland) right footed shot from the centre of the box is too high. Assisted by George Honeyman. Kazenga Lua Lua (Sunderland) wins a free kick in the attacking half.